Yesterday, I was scheduled to have lunch with a business associate and new friend at Olivia’s Good News Cafe in Franklin. My morning had been hectic with a few minor annoyances, and, as it happened, it was about to gather one more. The bad news for The Good News was that they had gone out of business. Rats! I had been looking forward to healthful food choices from a restaurant that was almost completely locally sourced. After some grousing, we decided on another healthful place; so, I drove there. Now, my companion’s morning had been a perfect storm of delays and she was late. Since I got there before she did, I roamed around, checking out the buffet while I waited. Suddenly….. Inside my brain, I was a 14-year-old Beatles fan. There was squealing, jumping up and down, even a little fainting – okay, so maybe no fainting, but there was definitely squealing and jumping. Right there, getting his lunch, not ten feet away was my favorite Nashville Predator – defensive-man Hal Gill. I’ve been a fan of his since he played for the Pittsburgh Penguins and I was just thrilled when he joined the Predators at the end of the 2012 season. 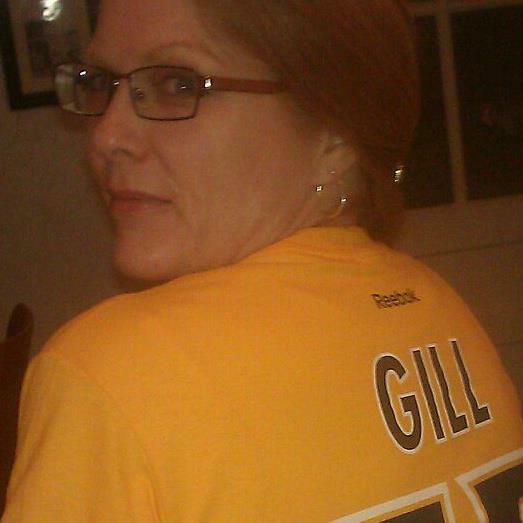 Yes, in the photo that is my ONLY Preds shirt with a player’s name and number on it and, yes, it is #75, Hal Gill. I <heart> Hal. Many years ago, when M*A*S*H was the biggest show on TV, my sister saw Alan Alda in the cathedral in Cologne, Germany. As anyone might have, she asked for an autograph. He politely refused, saying that he was there on a personal trip. None of us had ever really thought of that before – a celebrity being a private person, wanting to do private things. Fearing a scene, Mr. Alda immediately left the cathedral after my sister’s request. She felt AWFUL! When I saw Mr. Gill there with his wife, I didn’t want to mess their day up; so, I debated what I should do: leave this private couple alone? or pay him a quick, discreet compliment? I opted for number two. I stepped near the couple, said I didn’t want to intrude, but just wanted to quickly say how much I love watching him play hockey. Both of them seemed a little surprised that I had recognized him outside of his normal context; however, they were both very gracious, thanking me for my comments as I moved away. A friend was a little bummed that I didn’t get a photo, but since Mr. Gill was there as a private citizen, not as a professional athlete, I didn’t think it was appropriate to intrude that far. To that point in the day, I’d run into several potentially annoying events. I’d chosen to remain positive in dealing with them (although those below the speed limit drivers in the passing lane are a CONSTANT test). I believe that by remaining positive, I remained open to the world around me which allowed me to notice who was standing there. My positive reactions led to a chance encounter that, even without the photographic memento, will be the highlight of my week, month, or, heck! who knows how long?! If Like attracts Like, then positive attitudes attract positive experiences. The trick is to remember to maintain the positive attitude. Um, I’m really not so good at that trick. However, my experience at the buffet has given me another touchstone to help me persevere in the struggle to hold a positive attitude. Although I have neither photograph nor autograph from this encounter, I do have a Preds’ puck on my desk from before. I’ll be using that puck as my positive thinking talisman for the foreseeable future. So, what about you? Are you hard-wired to be bubbly or is it a struggle for you? If it’s a struggle, what talisman do you use to remind yourself to become or stay positive? This reminds me of when I met Steve McQueen. He and I stood on the sidewalk in Carrolton, MS talking like two normal people. After about 10 minutes, others recognized him and literally push me out of the way. As the sea of people surrounded him, he gave me a glance and said, ” I am sorry.” I was walking to find my friend Janice when he pulled up beside me in his car and told me that it was nice to have talked with me. I asked if he would take off his sunglasses for a picture and he smiled for my photo. This high school girl realized that celebrities never have a normal life. It made me really sad for their lose. Thanks for just keeping the joy in your heart. I think it is a continual struggle to do what you think is right, then battle with telling everyone how awesome you are in dealing with struggles!